Illegal aliens have been swarming the southern U.S. border in larger numbers in recent months as they attempt to get into the U.S. before Donald Trump gets a chance to make good on his vow to build a wall. Between October and February, Customs and Border Patrol apprehended 150,304 people attempting to illegally enter via the southern border, about 24 percent more than the same timeframe a year earlier, according to a Reuters report. “They think they need to take advantage while they can,” Blanca Rivera, a manager of the Ciudad Juarez migrant shelter, told Reuters. More than 20,000 unaccompanied minors were detained after illegally entering the U.S. from October to January, over a 100 percent increase from a year earlier. 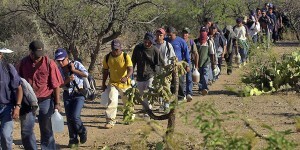 Some illegals have said in interviews that they are trying to cross the border now instead of waiting to see if Trump or another Republican wins the Nov. 8 election. “If Trump wins, we’re all screwed and all Latinos are screwed,” Isaias Franco, a 46-year-old from El Salvador who was deported from the United States late last year and is now trying to get back, said at a migrant shelter in Ciudad Juarez, just across the border from El Paso, Texas. Reuters also reported that so-called “coyotes” or human smugglers are telling illegal aliens that they need to get into the U.S. sooner rather than later. Meanwhile, Trump was embraced on Super Tuesday (March 1) by voters in Laredo, Texas – America’s most Hispanic city. Trump won almost 35 percent of the Republican primary vote in Webb County, where Laredo is the county seat, comfortably ahead of Marco Rubio (28.4 percent) and Ted Cruz (28.2 percent). Trump won more votes in Webb County than were cast in its primary in total in 2012.